Montgomery Public Schools: THE BROWSKIRTS ARE COMING! Large numbers of Montgomery County citizens have been collecting petition signatures throughout the county asking the government to put the new transgender discrimination law on the ballot. The petition collection has been a resounding success as the citizen groups have collected over 20,000 signatures. It appears that the citizen groups will be successful in their efforts despite out right dishonesty by all the council members. The new transgender bill prohibits discrimination against so-called transgender people in public accommodations. All the council members when questioned about this, claim that public restrooms and showers are NOT public accommodations. Huh? That’s news to every lawyer in the country. You don’t have to go to law school to know that public rest rooms are EXACTLY public accommodations. A nonpublic accommodation would be the bathroom at your home. How much dishonesty will thepublic accept from the county council? Seeing the enormous turnout of the public against this controversial bill and since the dishonesty campaign of the council failed, the gay and transgender community went into action. The gays and transgenders went to the petition collection sites and attacked the citizens involved. These attacks are said to be verbal and physical. 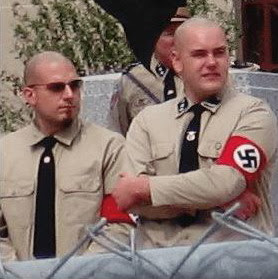 Members of the Citizens for Responsible Government (CRG) http://www.notmyshower.com/ are looking into a lawsuit to stop these Nazi brownshirt tactics. These are same tactics Hitler used to gain power in 1930s Germany. Hopefully the MoCo citizens will not accept such intimidation tactics and vote out the ridiculous bill that violates several parts of the constitution.